Sunday, June 2 2013 - Le Porho and Franks win Canadian titles. David Le Porho (QC) and Meggan Franks (QC) were crowned Canadian Champions in the men's and women's races, respectively, at the Canadian Mountain Running Championships this weekend at the Asics Xtrail race at Mt. Sutton, Quebec. 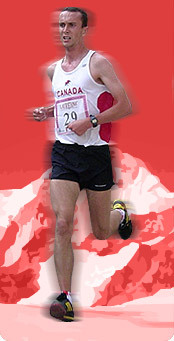 Le Porho, who represented Canada at the 28th World Mountain Running Championships in Italy last year, won his first national title in mountain running in a time of 1:01:49. Le Porho finished ahead of Jeff Gosselin (2nd - QC) and multiple-time national team member Kristopher Swanson (3rd - BC). In the women's race, first-time mountain running competitor Meggan Franks won her first Canadian Mountain Running title. A veteran of the roads, Franks won the race in a time of 1:18:32 ahead of Sarah Bergeron-Larouche (2nd - QC) and 2012 national team member Shannon Penway (3rd-BC). The top three competitors in each race automatically qualified for the Canadian team which will compete at both the 29th World Mountain Running Championships in Poland in September and the 10th NACAC Mountain Running Championships in New Hampshire in July. Also qualifying for the World Championships team which will compete in Poland are Calum Neff (4th - AB) and Alister Gardner (5th - QC).